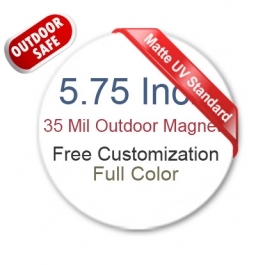 Custom 5.75 inch circle magnets outdoor safe is being employed by many newbie advertisers for outdoor campaigning because it gives best visibility to their business messages. This magnet may not be as effective as a larger- than- life billboard; still it can acknowledge or attract customers from close quarters. By affixing promotional 5.75 inch circle magnets over car doors or car bumpers advertisers can be relaxed that their business messages are going to seen in traffic jams and parking area. A personalized 5.75 inch circle magnet is also a best bet for all these small budget advertisers because its fade resistant, water repellant, and outdoor safe.